We're showcasing all that California has to offer right here including accommodations, restaurants and upcoming events. Make this web site your springboard for jumping into the Cities and Lifestyles that make up our paradise! The natural beauty of the state is undeniable. Where else in the world can one find sandy beaches, harsh deserts and majestic mountains all within a couple hundred miles. In addition, California's numerous man-made attractions give tourists endless options for entertainment. The greater Los Angeles area offers many top-notch theme parks, including Disneyland, Knott's Berry Farm, Magic Mountain and Universal Studios. Disneyland gives kids of all ages the chance to go on thrilling rides, discover a myriad of themed lands, watch professionally enacted shows, and meet their favorite Disney characters. For tourists who really enjoy amusement park rides, Magic Mountain is hard to beat. Some of the most thrilling rides every created reside here. Knott's Berry Farm also offers an abundance of family-friendly rides and thrills, in addition to animal attractions. Universal Studios is as essential experience for any movie buff, with unique rides and exhibits from many popular motion pictures. The beaches of Southern California are renowned for their boardwalks and surfing. Whether visitors are looking to relax and get a tan, play some beach volleyball, or ride the waves, opportunities abound. Venice Beach is one of L.A.'s most fashionable spots. Numerous walkers, bikers and roller bladers use its long, paved boardwalk. Many interesting street performers can be found here as well. Hermosa Beach is a long sandy beach that inspired the Beach Boys' famous surf music. Surfing lessons are often available at many of the beaches for those who want to try this exhilarating, yet challenging sport. Northern California is not as popular for tourists as the southern half, but visitors will find bountiful attractions here as well. 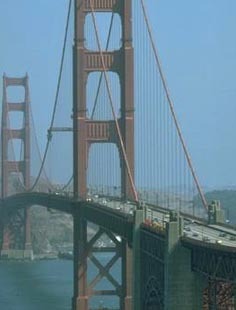 The beautiful city of San Francisco is one of the top places to visit. The "City by the Bay" features the famous Golden Gate Bridge, the former prison island of Alcatraz, and a world-class seafood market with many interesting shops to explore. San Francisco is especially nice to visit during the summer, when fresh ocean breezes keep the city much cooler than most of the state. California is heavily populated from north to south along the coastline, but they state offers significantly different ecologies. In Northern California, one is much more likely to see signs of the four seasons, get cold temperatures and more historic feel in locations such as San Francisco. Southern California, on the other hand, has an extremely moderate climate with temperatures rarely dipping below 60 degrees even in the winter. Rainfall is also scant with San Diego receiving roughly 11 inches a year. If you are considering moving to California, there are two constants throughout the state. 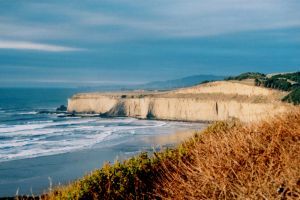 Mendocino, perched on a bluff overlooking the California coast, is a small town where the tang of the sea drifts across the rocky headlands, and curlews drift on the wind. In the early spring, the lilies, iris and wildflowers splash the hillsides, and gray whales on their annual migration to the Arctic pass by in stately procession. Hiking trails through forest glades wind past gurgling creeks and inquisitive squirrels. Beyond the pebble-strewn beaches, the Pacific ocean stretches to the horizon of the western sky. A blanket of fog cloaks the Pacific with a mystical veil and permeates the palms that line the sandy beach-boulevard. As soon as the morning mist dissipates, the distant powder playground will become a magnet for outdoor enthusiasts and bikini-clad sun worshippers. Surfers and sailors will skim the oncoming waves, while fishermen search for habitants beneath. And while volleyballs rally over sugar fine sand, the paralleling pathway will become a thoroughfare for cyclists, in-line skaters, and those out for a casual stroll. Santa Barbara's scalloped coastline is just one of the many splendid vistas offered from the lookout tower of the city's courthouse. In fact, from this heaven-bound podium I'm privy to a three hundred and sixty degree view that zooms in on the many tourist treasures. Most people associate the beach with summer, and Southern California's coastal gem, Del Mar, is no exception. Summer is when the crowds come: school's out, the Del Mar Fair starts in mid-June and shortly after the fair ends, the horses run at the world-famous Del Mar Racetrack. The thoroughbred horse racing season begins in mid July and goes through early September. The hotels and motels are sold out, beach rentals are scarce and expensive, the restaurants have one hour-plus waits, and the beach and roads are crowded. There is a bit of a hectic pace during the summer in this normally laid back town, located just north of La Jolla. However, the locals are patient. They know that after the race track closes, the tourists, students and race fans leave, the town returns to that kicked-back pace. But they also know that some of the best beach weather of the year begins then. Catalina Island California	Catalina is wonderfully unique in that it is the perfect distance away from the mainland. It is close enough that you can get there by a one-hour ferry ride, but also far enough away to feel totally separated from the mainland altogether, giving you the full experience of a tropical resort isolated in the middle of the Pacific. 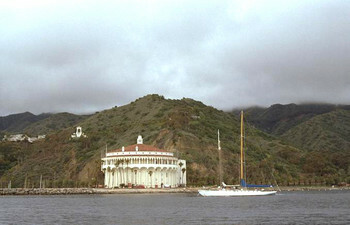 There is one major resort town, the City of Avalon, where you will arrive by any commercial water route. Once there, the Island has 76 square miles of adventure in every form waiting for you, from mountain climbing to scuba diving, all within easy reach of your luxury accommodations.